Good Morning! Thank you for stopping by! We've announced the Annual Anything Goes challenge and it's truly anything goes! If you want to share a lovely plate of Christmas cookies, please feel free! 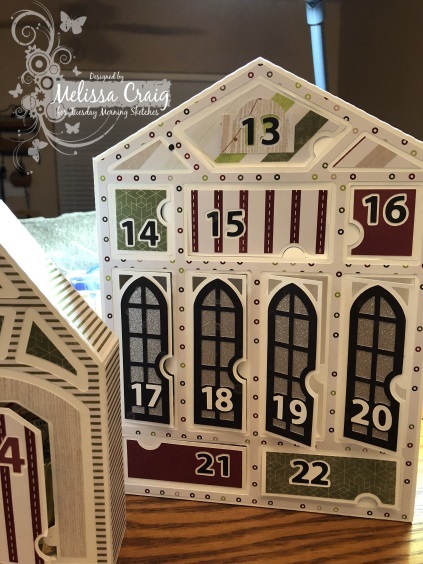 For my Anything Goes project, I am sharing an advent calendar by SVG Cuts that I have been dying to make for so long!! So I made this one for the little girl next door. I need to stop calling her that, she's 12! Not so little girl. But I am so glad she's shared the enthusiasm that I have for this project. Is this not the coolest! 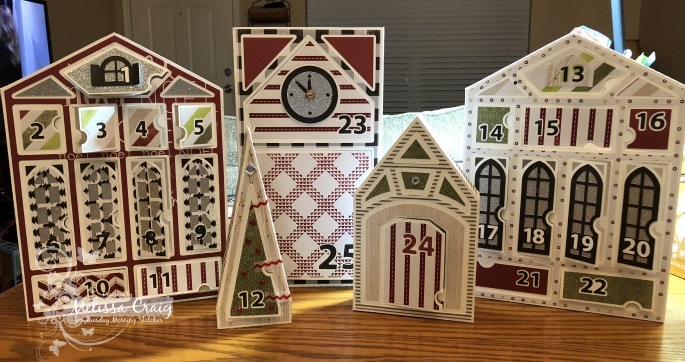 I used some beautiful Christmas papers, a collection called... hmmm, okay it doesn't have a name but it's by Heidi Swapp. I hope you enjoyed by project and that it encourages you to give it a try if you've been hesitant as well. Please join us, you have two whole weeks to do so. Okay head on over to the TMS blog to join in the fun! And be sure to visit the team, too. Good Morning! Thank you for stopping. The last sketch of the year is up at Tuesday Morning Sketches and it's a nice easy sketch from Janice. I think you're going to love it! Our sponsor this week is All Dressed Up and my card features Jam Jars. I have always wanted to do a grayscale card so I figured it was time to do it. I don't know what started this inspirational path of gray but I think it turned out really nice. I colored it using C1 to C7 Copic markers. My card features paper by DCWV, a banner die that I got on clearance on Ellen Hutson website, a sentiment from Altenew and oval dies from CC Designs. Hello! Thank you so much for stopping by. The newest sketch is up at Tuesday Morning Sketches and it’s a little challenging but there is so much inspiration on the blog you’ll have your creative juices overflowing. Our friend Bonnie of We Are 3 is sponsoring us again. 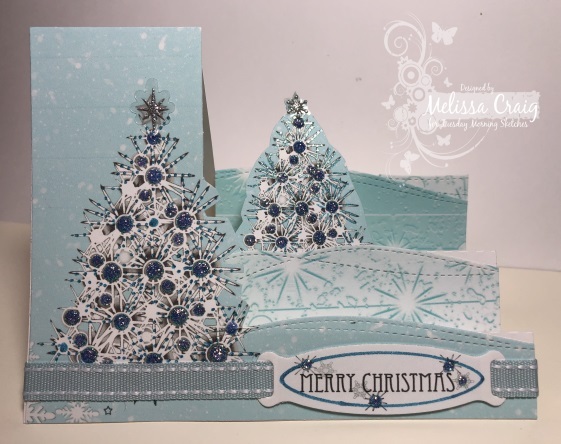 My card features her beautiful digital papers, Color Me Christmas. When I designed this sketch, the side stair step card and dies were what I had in mind. But I love how this turned out - it’s better than what I was originally thinking. I printed two of the papers that come in the paper pack. When I originally printed, I had the piece with the tree too small but that worked out okay anyway. I enlarged it and then copy/pasted it and flipped it so that I could extend the blue part of the paper and I cut off the tree that was on the right side. I hope that makes sense. Then I just added the other papers and I really love the one I used on the steps in it ombré beauty. It worked perfectly with the snow drift dies from Simon Says Stamp. I then decorated the trees with Stickles, blue glittery gel pen and then added some silver snowflake stickers for the stars on the trees. 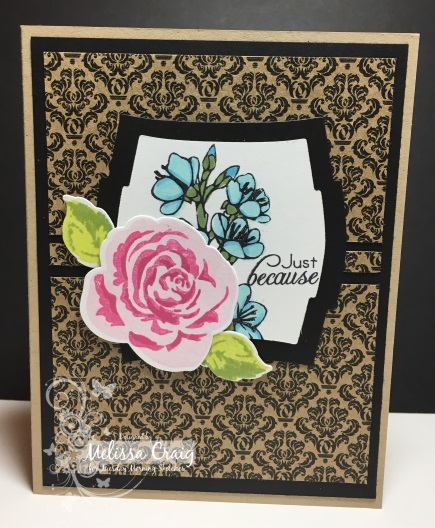 I added the sentiment that also came in paper pack, using one of “the original dies” - that’s what I call the first sets of dies that came out from Spellbinders. Before taking the sentiment out of the die I used the gel pen to draw the inside of the die and then added ribbon. Do you recognize the ribbon? 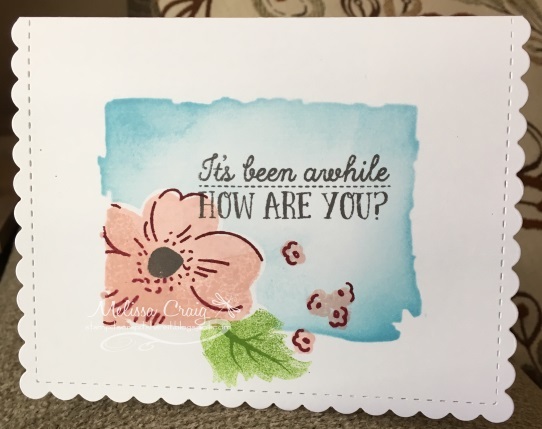 This was from Stampin’ Up! from several years ago! It’s been a long time since I put ribbon on a card! I do wish the pictures looked as good as I thought they did on my phone. I was also trying to capture the sparkle and I just didn't. Anyway, I’m really super pleased with this card and guess what.... it’ll still mail with a single stamp! Hello! Thank you for stopping by. I'm sorry about not posting last week. I'm pretty sure I threw away the card I made because I couldn't find it anywhere. I saw some really cute cards by players and I hope you had a nice Thanksgiving. The latest sketch is up at Tuesday Morning Sketches and we're sponsored by Pink & Main. 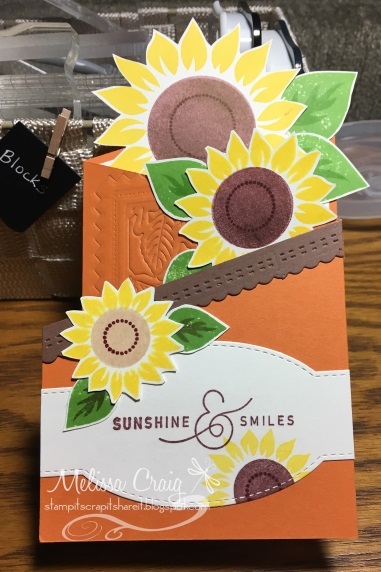 I purchased stamps and dies to share a couple of ideas with you. My cards, yes, cards... plural. I made two to share with you! 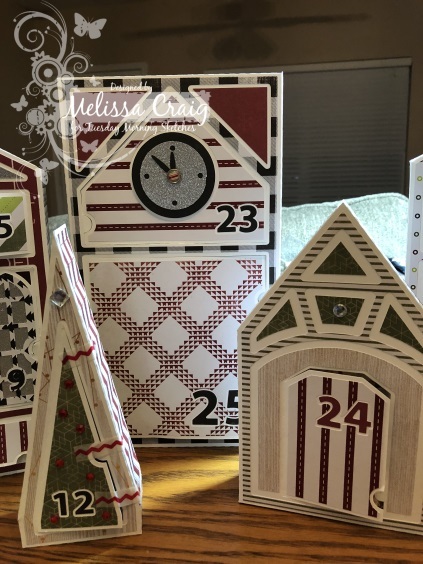 My cards feature stamps and dies called Christmas Window. I colored the image using Prismacolor pencils. I think when I picked this stamp I envisioned making a shaker card but I'm not sure how I thought I was going to do this. The image was a lot of fun to color - even the teeny tiny details, it was just relaxing. 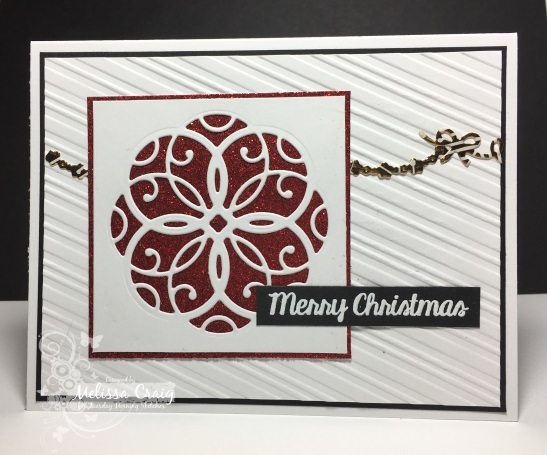 I finished the card by embossing the base panel with a chevron pattern and adding washi tape that actually says Happy Holidays but you can only see Happy Days. I guess that works, too. Lori Whitlock has a couple of layering cards in the Silhouette Online shop and I've had these forever. I hadn't used them but thought this burst one would be perfect for my base card. My lighting wasn't great, but the actual card base is School House Red by Simon Says Stamp. I cut the 3 layers of the burst using my Silhouette Cameo and glued those together. I cut the sentiment and used the negative piece - behind it is another strip of card stock covered with washi tape. I colored the holly using Distress Oxide inks Candy Apple and Cracked Pistachio. Well, we'll see you over at the TMS blog and be sure to visit the team. They are the best around. Hello - thank you for stopping by. This week's sketch is up at Tuesday Morning Sketches and I think it's lovely! It has some pretty easy elements and it's going to be a great jumping off place for your cards, too. I am really excited to share my card with you today. I love how it turned out! 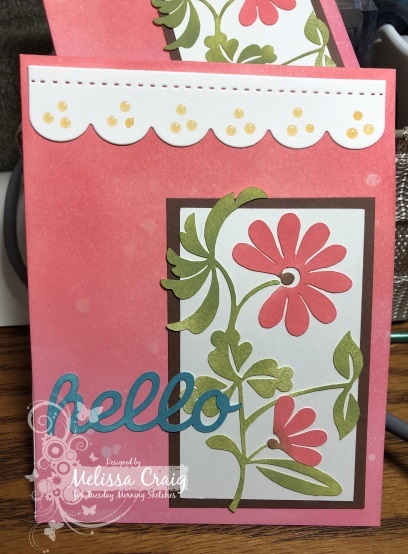 My card features stamps from Pink and Main, retired border die from MFT Stamps and a stencil by me! Yes! I made my own stencil - it's basic but hey, so is this stencil. I made it using my Silhouette Cameo and a piece of stencil material that I purchased at Michaels with a 50% off coupon. This stencil material is 12x12 and you get 3 sheets so I'll be able to make 12 of them for about the cost of that stencil I linked. Using Iced Spruce Distress Oxide ink and a round blender tool with my homemade stencil I created the background. Then using the same ink I colored the card base and scrap for the border. I stamped the image onto some card stock and then did some simple water coloring with Distress Oxide inks Candy Apple, Vintage Photo and Fossilized Amber. I originally stamped it with the stamp in the MISTI with Memento Tuxedo Black ink and then when I was finished with coloring the image and it was dry, I placed it back into the MISTI and over stamped it with VersaFine Black Onyx ink and finished it off with clear embossing powder. 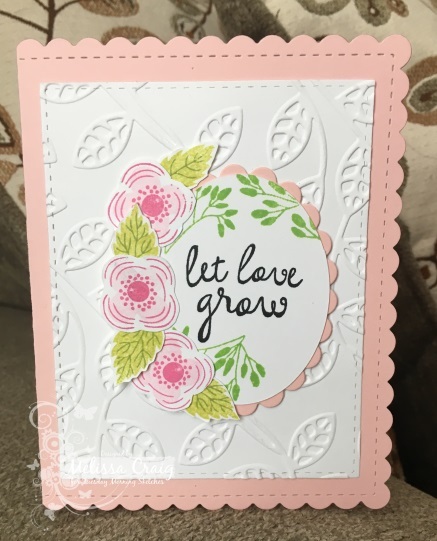 I also heat embossed the sentiment using WOW White pearlized embossing powder. It didn't even feel that snug when I started rolling this through the Cuttlebug and then SNAP! C plate busted in half. Hello! Thank you for stopping by. The sketch is up at Tuesday Morning Sketches and it's a fun one. It looks complicated put it's really not. Just break down the elements and it'll be really simple. Our old friend Bonnie opened up a digital store of her own called We Are 3. She is sponsoring this week and was so generous to give us some goodies to play with. 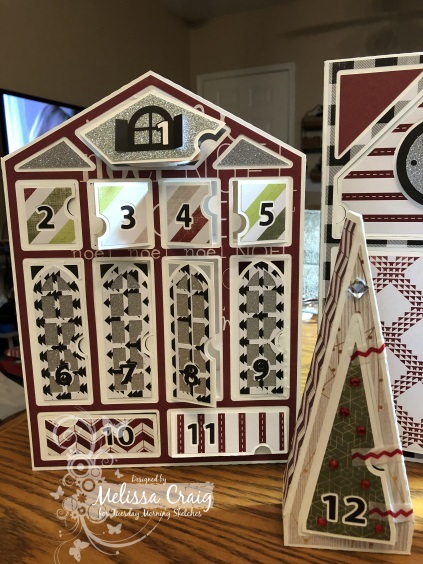 I kept my card really simple, I must confess I am working on Christmas projects that I need to get done before Thanksgiving so my cards have taken a place on the bottom rung of the priority ladder. 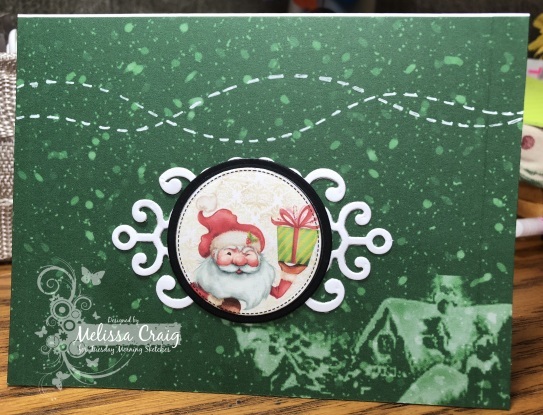 My card features Glitter Tags and Storybook Christmas papers. I cut the santa image out from it's glitter border because I wanted to keep my card a bit muted for a masculine type card. How I made this card. First of all, I opened up a word document and made it landscape. I opened up the digital paper and moved it to the furthest bottom right corner. The paper measure 6x6 so I didn't want to resize it which could distort the image - that house is too pretty to distort. I drew a box that measures 4 1/4 x 5 1/2 and placed that over the image that I wanted to print. I then "whited out" the areas that I didn't want to print by drawing white boxes. (Now I know many of you are wondering why I did it this way. I don't own photoshop so this is how I get it work.) Then I removed the original box. I then brought in my Santa image off to the side and printed this all at one time. I cut the card portion out and scored as I usually do. I then cut a piece of white card stock using the Moroccan dies by Spellbinders. I cut a black circle. I layered the focal image to the black circle and that to the embellishment piece. 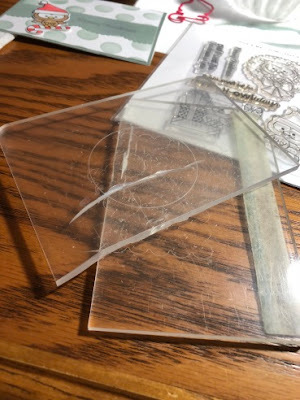 After that I just took a snowdrifts border die and laid it on my card and drew stitch lines with a white gel pen using the border die as my guide. Easy! I do hope to see you over at the Tuesday Morning Sketches blog - you're gonna love it! And be sure to visit the design team, too. Hello! Thank you for stopping by. The sketch is up at Tuesday Morning Sketches and I think it's a fun one. I had a lot of fun creating this card. I must confess, I set out to have it look a Fall-ish, but I look at the photo and it's so bright and cheery it reminds me of Spring. 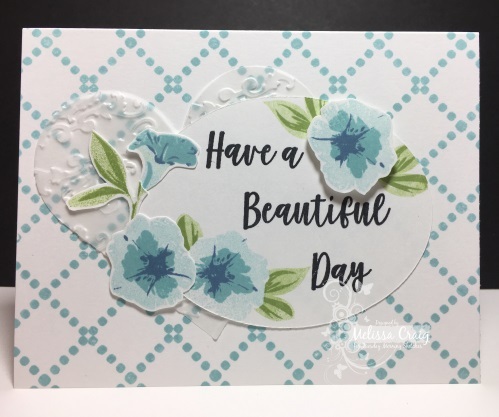 My card features svg cuts (flower and sentiment) by Echo Park available on Silhouette Online store, die cut border by CC Designs, everything was colored by Distress Oxide Inks and little embellishment by Nuvo Drops. I cut the svg images out of Natural White Neenah card stock. I colored the flowers with Abandoned Coral and Vintage Photo Distress Oxide Inks. The foliage was colored with Peeled Paint. The sentiment colored with Broken China. The card base I blended both Abandoned Coral and Worn Lipstick. I then spattered some shimmer water (water and Perfect Pearls mixed together). Unfortunately I couldn't capture the shimmer in the photo. 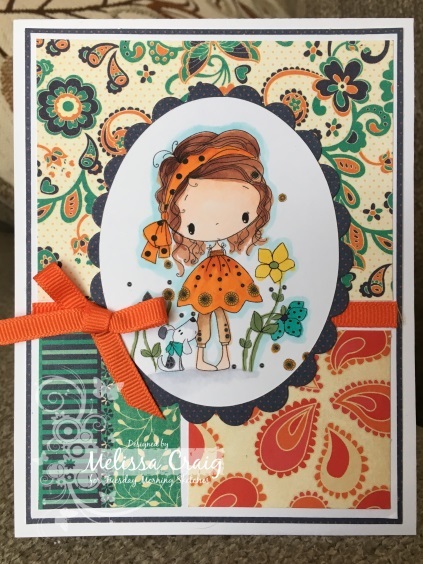 I finished the card off with some dots of Orange Marmalade Jewel Drops by Nuvo. 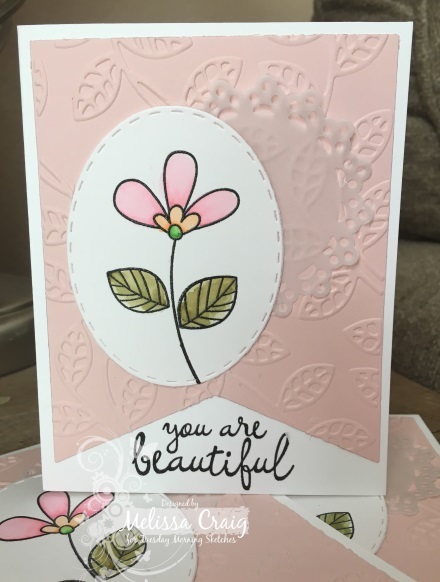 I am so happy with this card - I made two! Please be sure to join us and visit the team. We'll see you over at TMS. Good Morning! Thank you for stopping by. The sketch is up at Tuesday Morning Sketches - this one is by Debbie and it's a fun, one. Easy. It's a go to sketch for sure. TMS is sponsoring, the prize is a gorgeous embossing folder. Today's card features stamps, die and inks by Hero Arts. 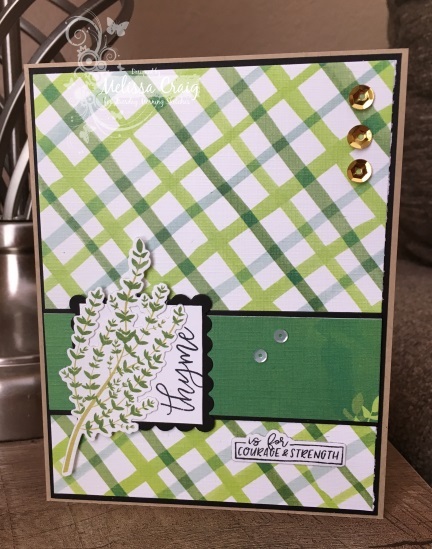 I am using the technique that was recently featured on Splitcoast Stampers. I think this is a great idea! I do apologize for the picture quality, I didn't get good lighting. My card also features a border die (retired) from MFT Stamps and a couple of ink colors are by MFT, too. The circle dies are by Fun Stampers Journey. I wanted a simple, fun and cheery notecard to send to my patients. I think they'll like this one. Be sure to visit the design team, too. They made some great cards to share with you! Hello. Thank you for your visit. I appreciate you being here. The sketch is up at Tuesday Morning Sketches and it's really a fun one. It's so open to interpretation, I know you're going to have a lot of fun with it. 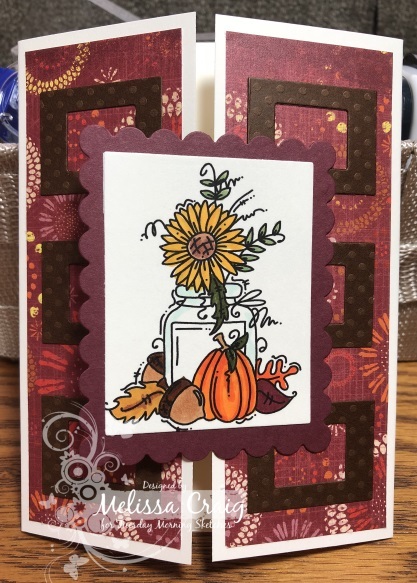 Our sponsor this week is Bugaboo Digital Stamps - my card features Autumn Jar and decorative paper by Colorbok. I decided this sketch looked like a gate fold card. I had some left over scraps from a pumpkin fairy house that I made for sister and used that for the frames I made from rectangle dies by Spellbinder. I did some simple coloring using Copics. Please be sure to visit the TMS blog to join us and leave some love for the most amazing DT ever of all time. Hello friends. Thank your for stopping by - I do appreciate and thank you for your visit. The sketch is up at Tuesday Morning Sketches and it's a really fun one. Super duper basic with easy elements and so open to interpretation. 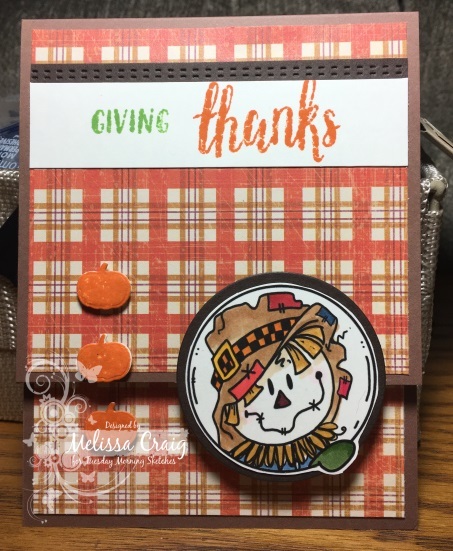 My card(s) feature the October kit from Simon Says Stamp. 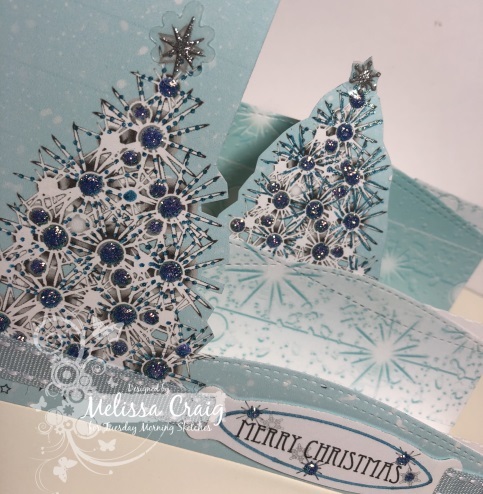 The papers that were included in this kit are absolutely gorgeous and can't be found anywhere! LOL It's called Blush by My Mind's Eye. I think I need a new embossing buddy because I didn't get clean embossing results even though I used it quite liberally. This one is the same but with a lighter base. Which is your favorite? Good Morning! Thank you for visiting me. The sketch is up at Tuesday Morning Sketches and I think you're going to really like this sketch. Our sponsor this week is Bugaboo Stamps. 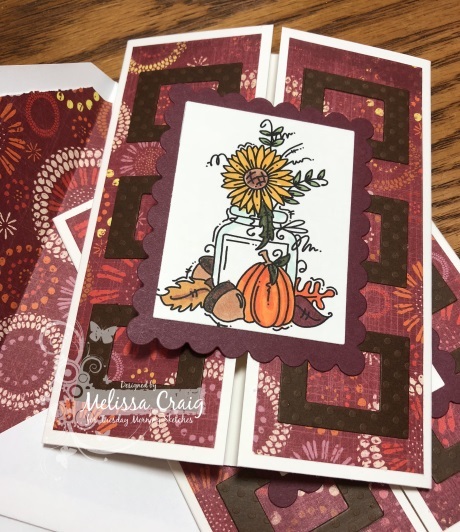 My card features Happy Fall Trio. I love how my card turned out. 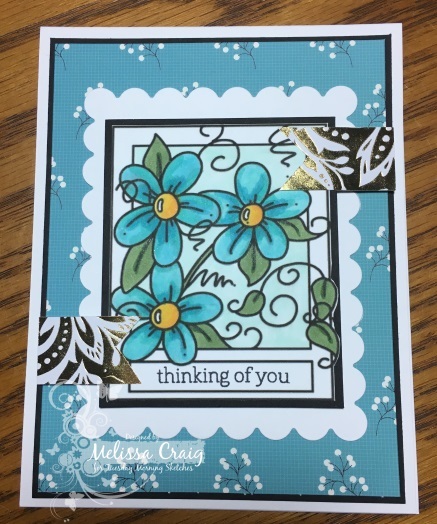 I wanted to try something new for me - I see Jennifer McGuire and Kristina Werner do partial cuts with their dies, so I thought it would look cool with this particular sketch. My card also features stamps from Hero Arts Sept 2016 kit, paper from Colorbok and I did simple coloring with Copics. Doesn't this scream Fall? I love it! And just look at the silly grin on that scarecrow. I printed it on Neenah Natural card stock and as I said, simple Copic coloring. Not too much blending going on. I lined up the circle die about half way up and put it through my Cuttlebug ensuring that the pressure was only on the part I wanted cut. Then cut the straight edge with paper trimmer. I finished the inside with cream colored card stock that I added a strip of the decorative paper. 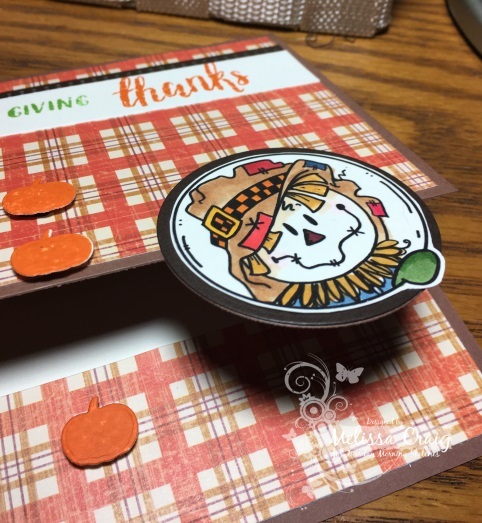 Then from the same Hero Arts kit, I stamped out the pumpkins and used the coordinating die to cut it out. Thank you for stopping again. 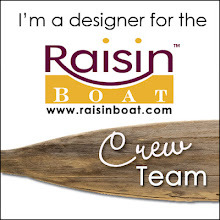 Please be sure to visit the design team's blogs, too. They'll appreciate your visit. Hi everyone! Thank you for stopping by. The newest sketch is up at Tuesday Morning Sketches and I think you're going to like it's simple elements and format. But don't get me wrong, it can certainly be elevated. I needed a quick, simple card to write a quick note to my son's friend who is in boot camp - I'm sort of her adopted mom like I am for so many of my kids' friends. I have to say I rather enjoy being an everybody's mom. When I was a kid there was Kool-Aid commercial where this mom was a Kool-Aid mom and gave all the kids in the neighborhood kool-aid. I wanted to grow to up to be that mom. Goal reached! Okay, so back to stamping. 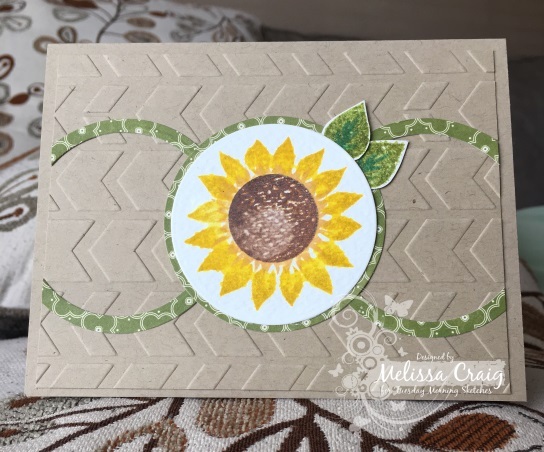 My card features Papertrey Ink's Sunflower Harvest stamp set and the dies are from MFT Stamps. I apologize about the lighting - it looked better on my phone. LOL! So it's basically a one layer card with the exception of the sentiment piece. Easy card that would make a great note card set. Please come on by the TMS blog and see the amazing cards my team created. Wow! Hello - it's been a long time since I've had a "just playing around" post. But I worked on for two days on this card to play along with Papertrey Ink's Make it Monday challenge. 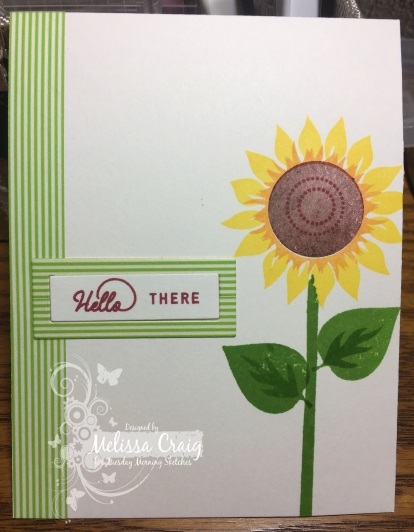 My card features Papertrey Ink's Sunflower Harvest stamp set, Mix & Mat: Pinked Edge Mat. Scarlet Jewel and New Leaf inks. The challenge was to create a Z fold card and I've always wanted to try this fold - without it already being a pattern from a svg cut. The tutorial was great! So easy to follow. 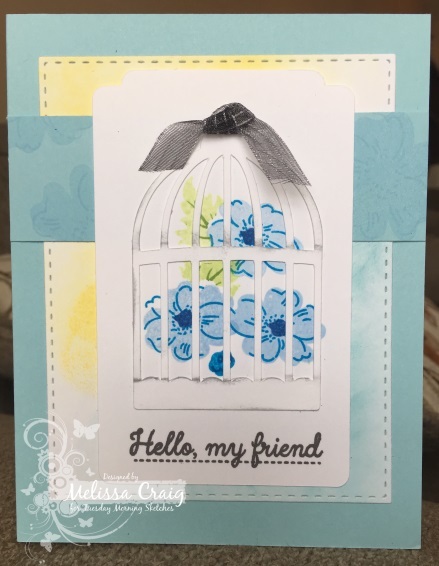 My card also features other inks from Memento, dies from MFT Stamps and CC Designs. This was a fun card to put together and I actually made 4 of them. You know, it really is easy to make more than just one card. Well, thank you for your visit. Hello! Thank you for your visit. The latest sketch is up at Tuesday Morning Sketches and it's by Jessi. I thought we ran out of her sketches but I'm thrilled to have found one more. 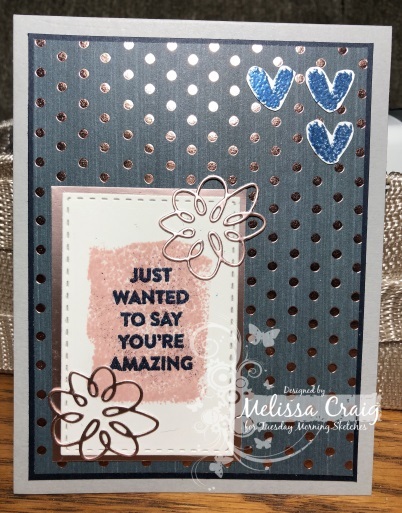 My card features a stamp from MFT Stamps, dies from MFT and CC Designs, embossing folder by Darice and a sentiment from Hero Arts. This card is so girly! I cut the pink panel from a banner stack of dies by CC Designs and then embossed it. I cut the doily piece out of vellum. The image I colored with Zig Clean Color real brush markers and water brush. Overall this was a really easy card to create and mass produce. I didn't add the embellishment piece mostly because I forgot it. Please head on over to the TMS blog to join us and you're gonna love what the design team created for you. You will surely be inspired. Hello everyone! I hope you all are doing well. Thank you for your visit. 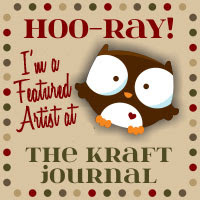 The newest sketch is up on the Tuesday Morning Sketches blog and it's a fun one by Janice. 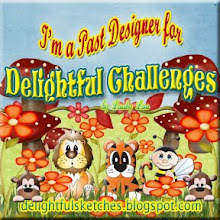 Our sponsor this week is Bugaboo Stamps - everyone knows these images and Jodi's distinctive artist flair! I love these images. I flipped the sketch so that I can use the Make it Snappy Thank You image. It also comes with a blank box so you can add your own sentiment which is what I did. I used some really fun papers - I love the base decorative paper. This dark teal was a lot of fun to pair with the bits of gold foil paper. I colored the above with Copics but the BG01 marker I was using dried up! Ack!! I printed 4 images and already had my other elements ready to create 4 cards. So I needed to change it up a little. So the 3 you see here (there's actually 4) top one colored with Copics (card above), the middle card I kept the flowers white and only highlighted with a super light (B000) Copic and the bottom card I colored with my Tombow markers. I still prefer the top card, but the middle card - which I made 2 of is my next favorite. On a personal note Brendan arrived in Japan safely and we've been able to video chat twice. Have a great day! 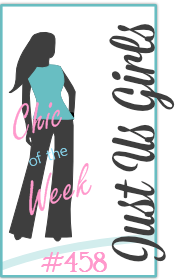 We'll see you over at the TMS blog - be sure to leave my team some big love! Hi All! Thanks for stopping by my blog. I wish I had a spectacular card to share with you! There is, however, a spectacular sketch up and ready for you to play with on the TMS blog. So I've been thinking about this card for a very long time and I couldn't get those thoughts to relay onto paper. I threw stuff away! Honestly, I think it's because my son leaves for his post overseas tomorrow so I've been wanting to spend all that I can with him. So I got these great border dies from Papertrey Ink that I've been dying to use and this sketch was made for them! But, again, I couldn't get my ideas to relay to paper and then the lighting. Bleh! But I think overall, these will make great notecards to send to my patients. 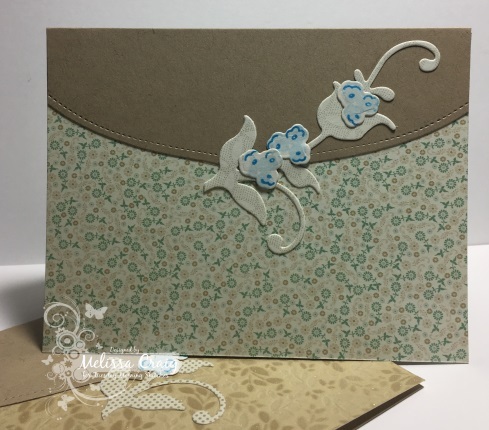 My card also features a leafy scroll die from MFT and stamps from Papertrey Ink. Okay, y'all - head on over to TMS to get some real inspiration from the design team - they ROCKED this sketch. I'm off to celebrate my birthday (yes, today's the day - ugh) with my kids. Hi everyone. Thank you for stopping by my blog. I appreciate your visit. The newest sketch is up at Tuesday Morning Sketches and it's a really easy one. It was great for what I wanted to try. I shared last week that I splurged on myself and bought the My Hero Arts July'17 kit. So it's not really expensive - particularly for what all you get in the kit. It's quite a value! But because I spent the money I am making myself make a bunch of cards with it. I've been watching videos on YouTube as I stumble across them that others are using this set. I found this one by Mary Polanco. She inspired me to make a scene with these stamps. I stamped the images using VersaFine black onyx ink and then colored them with Zig Clean Color real brush markers and a water brush. Then I cut out an oval to mask off the center and used Vintage Photo Distress Oxide ink. Then added some buttons that I literally was considering throwing away. Please head on over to TMS blog and join us! Have a fantastic day. Hello! Thank you so much for your visit. This is the last week of our month anniversary celebration - the sketch is up and the theme is to use your stamps! That means no digital images or die cut focal images. The sweet Iliana at My Sweet Petunia agreed to help us celebrate is and giving away the choice of an Original MISTI or a Mini MISTI. This is one the highest valued prizes we've ever had available. I'm thrilled that Iliana agreed to sponsor. So, I'm deeply disappointed that it has been overcast the last few days. I wanted to share a picture that really captured how beautiful this card turned out. Trust me, in real life, it's stunning even if I do say so myself. I treated myself, even though I shouldn't have, to the July 2017 My Hero Arts kit. I can't garden worth a hoot so my only way to enjoy beautiful plants is either by looking at my neighbors gorgeous garden or stamping them. My card also features a sentiment stamp from Altenew, a die cut border from MFT Stamps and the stitched oval die is from CC Designs. Let me also give credit where it's due. I did slightly CASE Tina at Cards and Coffee. If you go to this link, you'll see what I mean. I really only CASE'd the technique and the colors. I'm sure I'll be sharing more with you where you'll see a little of Tina's techniques and style influenced me. Please join us over at the TMS blog! Have a great Monday. Hello. So it has been a very long time that I've played along with other challenges. I found that I really kind of miss it. Sometimes.. most times my life is 2 things. Work and Tuesday Morning Sketches. Don't get me wrong - I love both and want to continuing doing both for a very long time. 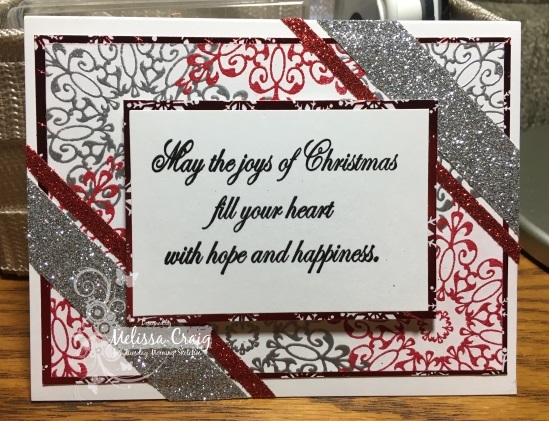 I've talked about being a Card Angel and sending cards to a couple of patients that are traveling a very hard road dealing with cancer and treatments. I don't know a lot about them or where they are in their treatment. It's a one sided conversation. 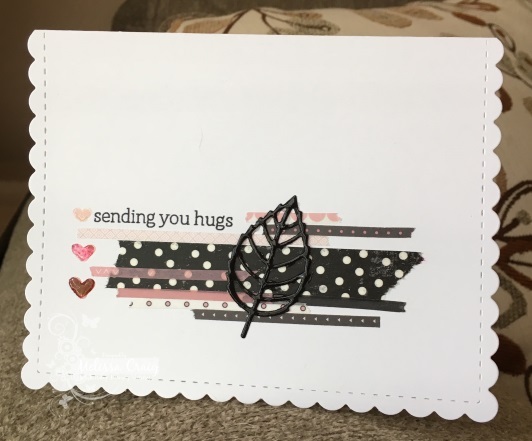 But because I do this I find that buy stamps to make sure that I continue to make pretty cards for them - to give them what I hope is a brief moment of happiness and joy with one of my cards. Is that vain or conceded or too proud to think my cards are that good? Not how I mean that at all. Anyway, so I recently purchased a couple of stamp sets with my 2 patients in mind. I saw this fun technique on You Tube and it really inspired me to play along with Papertrey Ink's Make It Monday challenge #290 (combining stenciling and masking). I thought this would be so pretty to share with these ladies. As I was wrapping up these card an email popped in. The subject "sad news." One of my patients lost her battle with breast cancer. 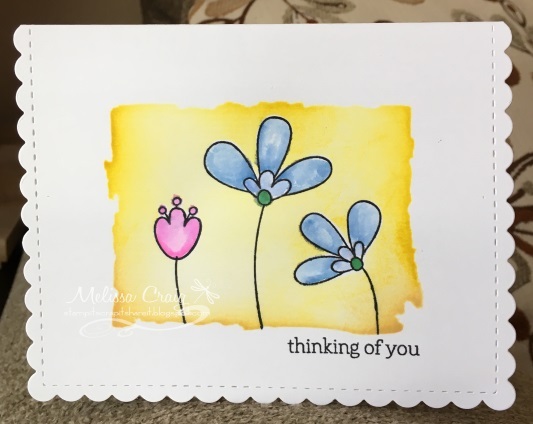 So one of my bright and cheery cards which didn't have a sentiment yet became a note card - I have to make a sympathy card for her family. I am deeply saddened by this - I didn't know her but I do know she left behind a little girl that is just 5 years old. As I write this post, I am grieving. Here are the cards I made for my patients and for the challenge. I hope you like them and that you'll keep this little girl who lost her mommy in your thoughts. 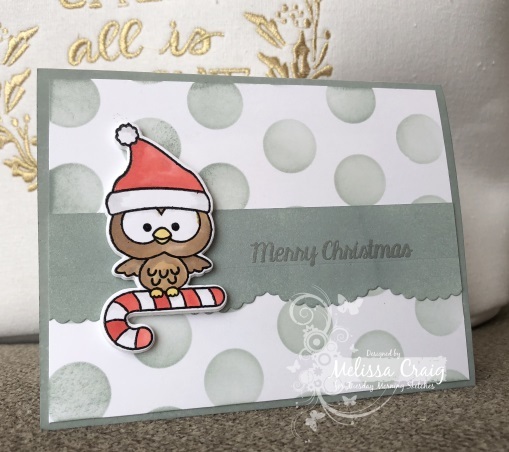 This card features all Papertrey Ink products (except card stock). 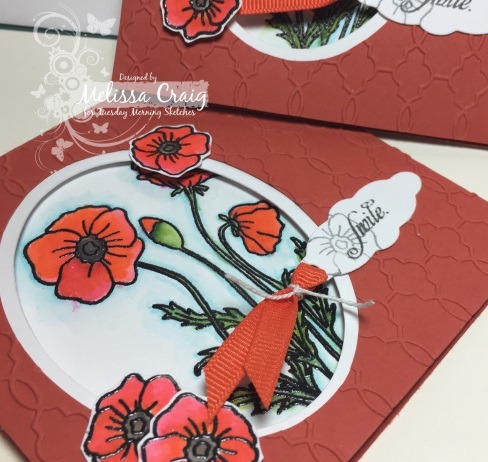 The die is called Noted Scallop A2, the stamps are from a set called Floral Sketches and the ink colors are Sweet Blush, Scarlet Jewel and New Leaf. The blue ink is Distress Ink - Tumbled Glass. This second card features the same Noted Scallop A2 die, but the stamps are Build-A-Bouquet by MFT Stamps, Thinking of You sentiment by Hero Arts, the flowers are colored using Zig Clean Color Real Brush markers and the yellow background is Distress Ink - Scattered Straw and Mustard Seed. Sorry the pictures aren't better - the house has way too shadows. Thank you for visiting. Hi all! Thank you for stopping by. 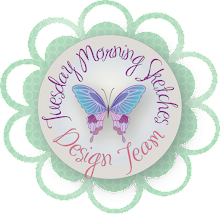 Please be sure to head over to Tuesday Morning Sketches blog - we're having a lot of fun this month! TMS is 8 years old and we're celebrating with prizes, great sketches and inspiring themes. 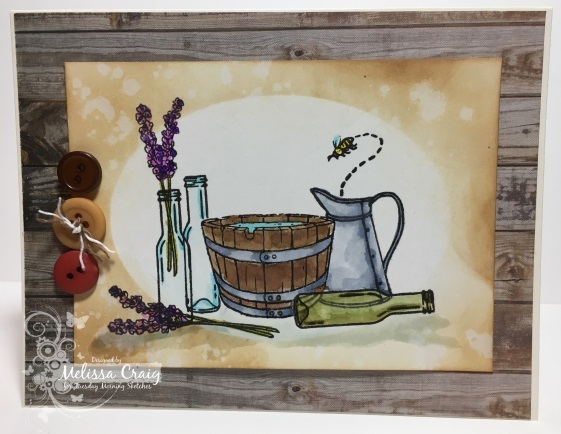 This week's sketch is by Debbie and the theme is use your dies. 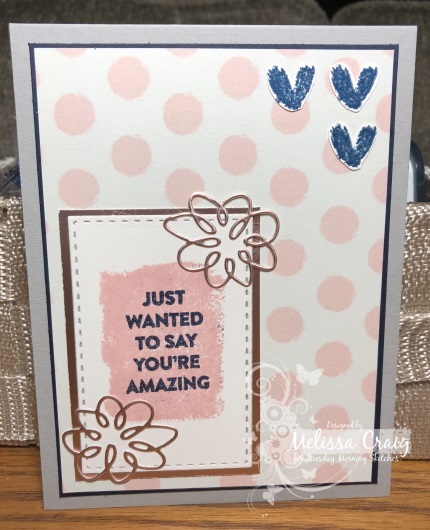 My card features stamps from MFT Stamps (Build-a-Bouquet), dies from CC Designs (Dotted Rectangle) and Pink & Main (hello sentiment). I kept this card very simple. I colored the flowers using my Zig Clean Color Real Brush markers. The sentiment I cut 3 of and then layered them together. I covered it with Glossy Accents which made it look like an epoxy sticker. This goes into my collection of cards that I send as a card angel. Again, thank you for stopping by. Please be sure to head over to TMS blog and the team's blogs. Say hello to our newest member, Carol. Have a fantastic day! Hi there! Thank you for stopping by. I do so love your visits. The sketch is up at Tuesday Morning Sketches and I think it's a fun one. Really open to interpretation. My card features nothing but paper from the Linen Closet Mat Stack. No stamps, no dies - just paper. What do you think? I think these are cute notecards - they were super quick and super easy. I challenged myself to look at these papers that always come in a mat stack that one never uses unless they're doing traditional scrapbooking and even then, it's debatable. There were some great pieces that worked as sentiments. Please be sure to head on over to the TMS blog and join us and leave my team some love. Have a fantastic day. Hello! Thank you for stopping by. The sketch is up at Tuesday Morning Sketches and this one was created by Debbie. I love the elements of this sketch! 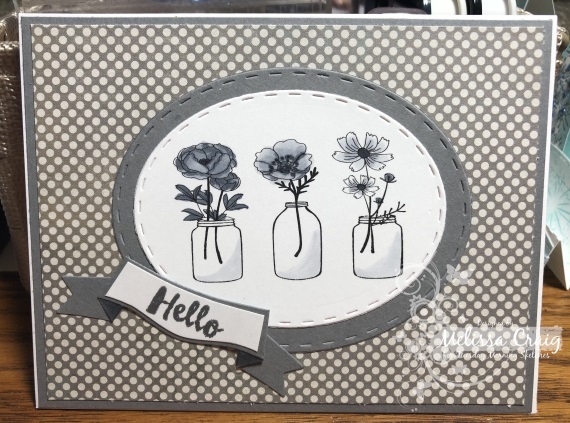 My card features stamps from There She Goes (closed) and Altenew. I've also had this paper stack from Hobby Lobby that is a lot of fun. It's all Kraft with black print. It's classy and fun! I think it's the perfect neutral back drop to make those flowers pop! Please join us - I'll be back around when I've recuperated a little more from the last two weeks. Good Morning! Thank you for stopping by. The sketch is up at Tuesday Morning Sketches and it's a good one. It's basic and simple and truly a blank canvas. We're also sponsoring - there's a super cute die up for grabs. My card was actually inspired by one I saw on Pinterest. That one uses some really great washi tapes but I wanted to use paper. I also got to use a die that I picked up probably 2 years ago on clearance for 97 cents. This a great notecard that is easily massed produced. I made 3 of them. Two for my Card Angel project and one for another card group. 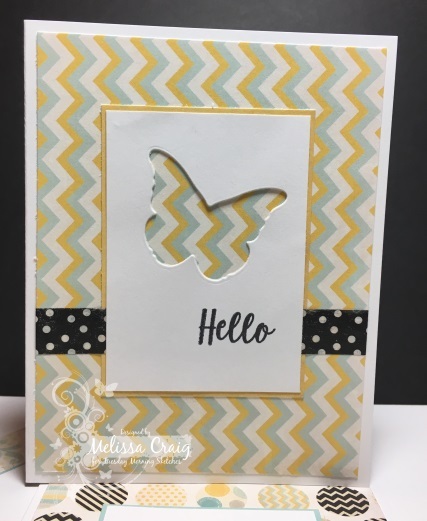 Hopefully you can see in the card below that I also made one as a shaker card using tulle. This technique I saw on a Jennifer McGuire video and was pretty excited to see another use for this tulle I have in my closet. These were so quick that I almost just kept going! Please be sure to join us at the TMS blog and leave some love for the team. I will be around as much as possible this week but my son graduates High School on Friday so I have family coming in and they're here until Thursday next week which is also the day I fly out to Chicago area to attend my oldest son's graduation from Navy Basic training. So I'll be around as I can but honestly, I know I'll be scarce. Good Morning! Thank you for stopping by. The latest sketch is up at Tuesday Morning Sketches and I've been looking forward to this sketch since Debbie sent it. But first - I have great news! I got to talk to my son this weekend. He's doing fine and adjusting to bootcamp life. He's a little tired of getting yelled at all the time, but he realizes it's only temporary. I was just so happy to hear his voice. 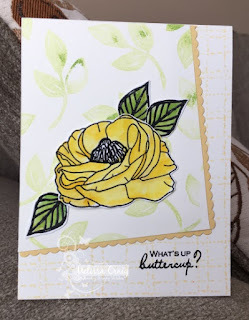 This card features Buttercup stamp set from There She Goes stamps (long since closed) and leaves from Richard Garay. It's a little hard to see, but I did stamp the card base with a background stamp by Raisin Boat. I colored the images with the Zig Clean Color markers. 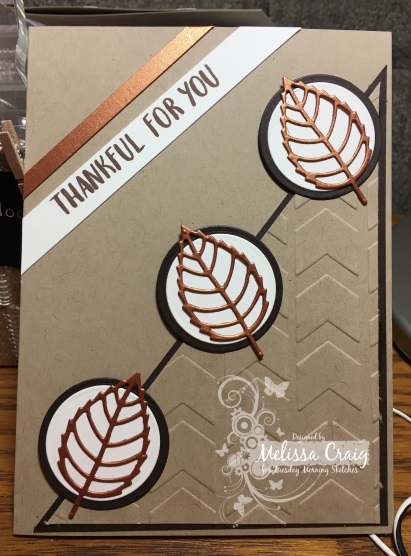 The leaves I 2nd generation stamped them using Limeade Splash ink (Fun Stampers Journey). In some places I didn't stamp of the ink so well but I like the overall affect. 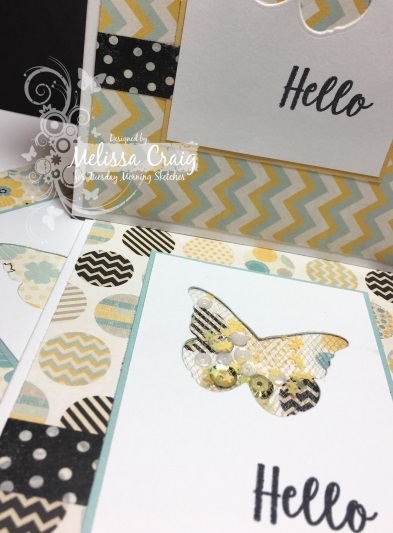 This one features Butterfly stamps and sentiments from MFT. 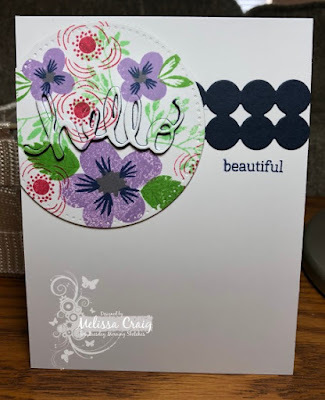 I stamped the sentiment using my MISTI so I can get some intense color. 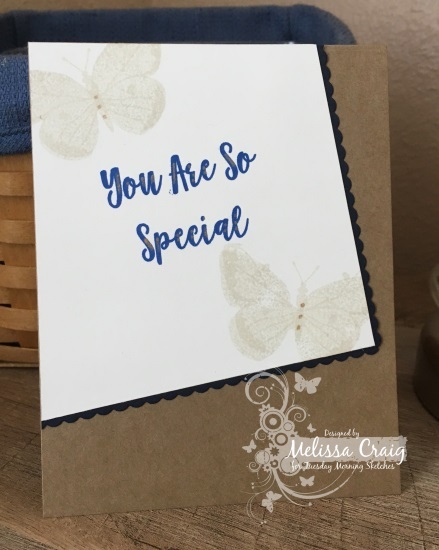 The butterflies I stamped with PTI's Soft Stone ink. Then I added some little touches with gold gel pen. We'll see you over at the TMS blog! Have a great day. Hello! Thank you for stopping by. The newest sketch is up at Tuesday Morning Sketches and I really love this one. It's so pretty! 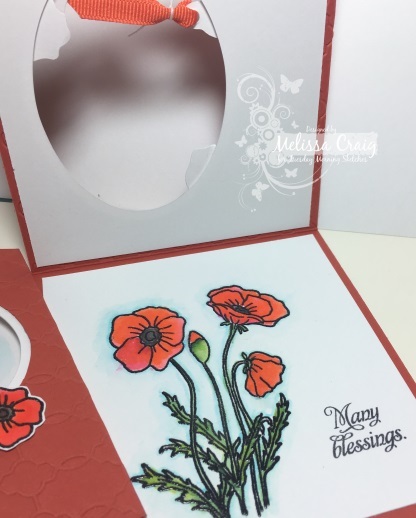 My card features an older stamp set from Sweet n Sassy Stamps - Poppies & Greetings. I got my tax refund, which trust me it wasn't much but the bright side of that was I didn't owe! But it was enough to finally purchase markers that I have been wanting for about 2 years now. I have coveted Kuretake Clean Color Real Brush markers and I watch all the You Tube videos when they are featured. So I found them in several places - but Amazon definitely had them for the best price. I got the box of 60 for $70 - on Blitsy, the box of 60 is like $170. Yes, one hundred and seventy. Well, so not in my budget. I may not have needed all these markers but I wanted to make sure I didn't get stuck with brights/primaries only. Anyway, I'm sure you got bored and just scrolled down. Here's my card. My card is 4 1/4 square. 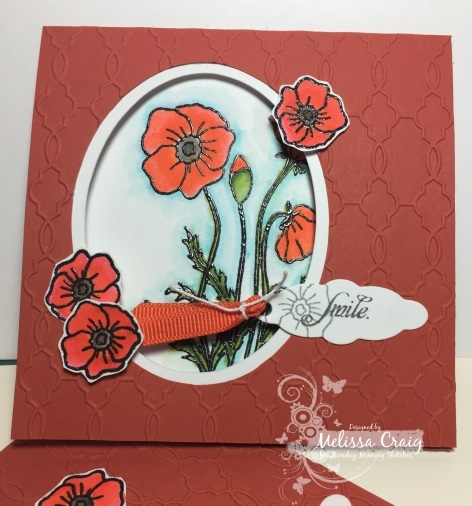 I stamped the image onto Bristol Smooth card stock and blended a red and an orange to get that pretty shade poppies have. I moved the color and blended just using a water brush. I did emboss the image with VersaFine onyx black and clear embossing powder. I did color around the image with light blue and used the water brush to blend out that color. Here's the inside view of the card. I watched a video yesterday morning (yep! made my card last minute) for Papertrey Ink - their challenge this week is to put a pattern behind a window. 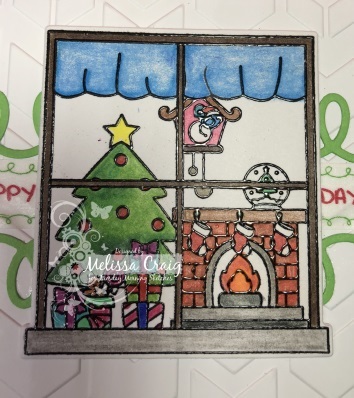 I can't join the challenge because I didn't use anything by Papertrey Ink, but I really liked the idea, so I put my focal point inside the card and cut windows. Please join us this week. And be sure to visit the team's blogs to leave them much deserved love.